When I said I was going to make a frozen hot chocolate recipe, Mike looked at me with a raised eyebrow. Frozen hot chocolate – isn’t that the most oxymoronic drink possible? Maybe, but it combines two of my favorite things – the flavor of hot chocolate in a frosty beverage. Frozen hot chocolate is a way to enjoy hot chocolate all year round, too. Even on hot summer days you can enjoy that hot chocolate flavor without overheating yourself. For our last movie night, I decided to try out a peanut butter hot chocolate recipe. Since we had a roaring fire, warm blankets, and a pile of dogs, the frosty beverage provided the perfect temperature balance. The peanut butter provided a hint of flavor and added to the creaminess. I’d like to try other add-ins like, hazelnut spread, chocolate syrup, and maybe even instant pudding mix. Let us know if you experiment and create something delicious. 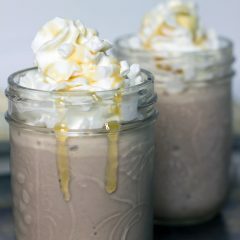 If you love the flavor of hot chocolate but the texture of frozen treats, try this peanut butter frozen hot chocolate. Add ice, milk, peanut butter, and one hot chocolate packet into a blender. Top with whipped cream. Other toppings ideas: dehydrated mini marshmallows, caramel syrup, chocolate syrup, peanut butter syrup, sprinkles, or any sort of chopped up candy. 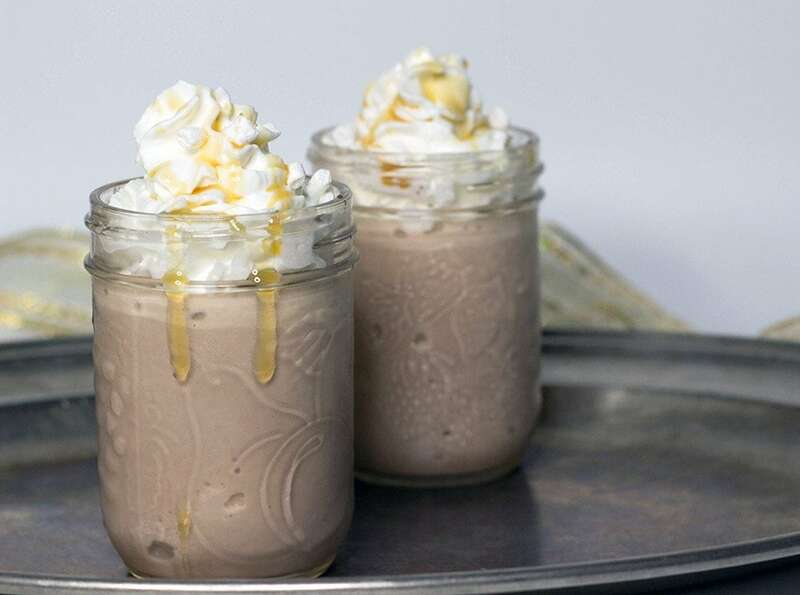 This frozen hot chocolate recipe was a delicious treat. It’s not as heavy and creamy as a milkshake, but still provides that sweet, frosty flavor that I crave. I can’t wait to experiment with other flavor combos. Packets of hot chocolate also make an excellent host or hostess gift. Last year our aunt had an impressive DIY hot chocolate bar during our family Christmas party. I plan to gift her a box of hot chocolate this year to help keep that tradition going. We like to keep hot chocolate mix around all season. It’s the perfect afternoon pick-me-up, after school treat, or a warmer-upper on snowy days. I love to make hot chocolate for Mike after he comes in from snow blowing or shoveling the driveway. 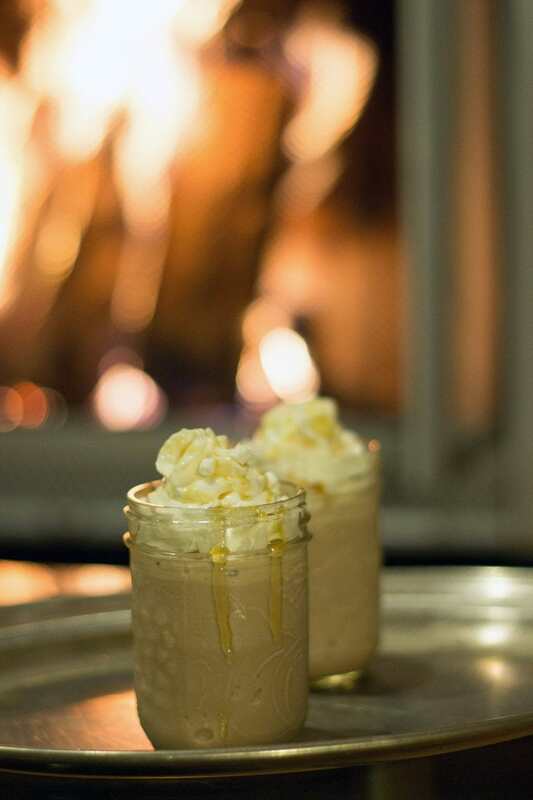 It’s the best way to thaw out after any kind of outdoor activity on those frigid winter days. 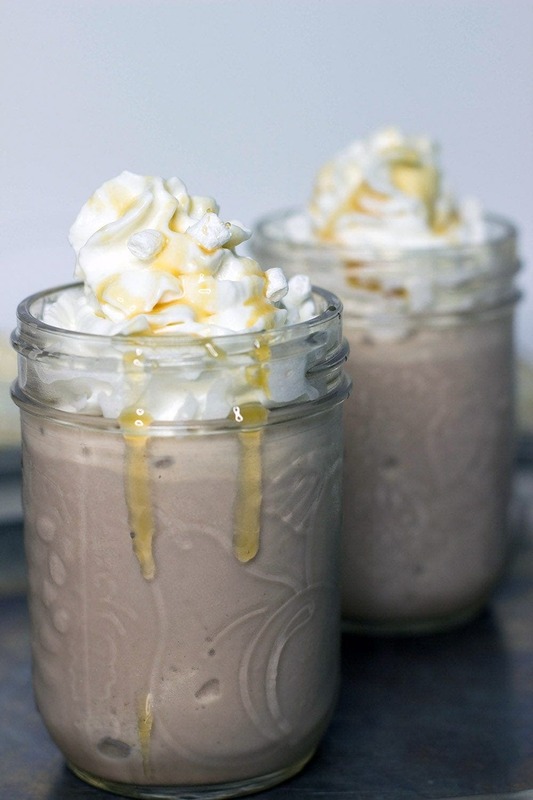 Have you ever made a frozen hot chocolate recipe? Let us know your favorite flavors to mix. I love hot chocolate. I would really enjoy trying this drink recipe. I would try it for sure. It is cold here too, and it would have to be inside where it is super warm. Luckily w have a woodburner thats close to a fireplace and thats where I would enjoy something like this too. It sounds good. Oh my, these look dangerous! I would love to try making them with coconut milk whipped cream. I bet that would be good too. This sounds very interesting. I like that there is peanut butter and chocolate in this recipe! I’ve never had frozen hot chocolate before but this sounds amazing.